Having been elevated to the shadow of the throne by one sibling, Thomas Seymour on this date in 1549 was seen to the block by another sibling. The brother of Henry VIII’s favorite queen, Jane Seymour, our Thomas was when that burly king kicked the bucket beautifully positioned for a share of power, being named to the regency council that would govern for his nephew, nine-year-old heir Edward VI. But Thomas Seymour would find like many a Tudor courtier before and after him, that around the throne it thunders. Courageous, empty Thomas — whom we shall call Sudeley for the sake of his barony* and our clarity — took a more generous estimate of his own talents and the boys soon festered a sibling rivalry of uncommon consequence. Our man connived to attract the favor of young Edward, inveigling and cajoling him to exercise his kingly prerogatives to lever Somerset out and Sudeley in. This campaign found little traction among fellow regents and finally came to the desperate strait of Sudeley skulking on the grounds of Hampton Court Palace one night in January 1549 in a possible adventure to kidnap the king. Instead, it landed him in the Tower with treason charges pending after he gave away the game by shooting one of the king’s barking dogs. It would afterwards emerge that he had conspired with a corrupted official of the mint to coin him a sum sufficient to furnish the rebellious army he had allegedly already begun recruiting. King Edward wasn’t the only underage royal to labor under Sudeley’s excessive attentions. the Admiral [Sudeley] had loved the Princess but too well, and had so done for a long while … [until] the Queen [Catherine Parr], suspecting too often access of the Admiral to the lady Elizabeth’s Grace, came suddenly upon them, when they were all alone (he having her in his arms). Whereupon the Queen fell out both with the Lord Admiral and with her Grace also … And this was not long before they parted asunder their families [households]. By the time Sudeley fell, he had resumed his suit of Elizabeth, Catherine Parr having died late in 1548 from childbirth — or, as was rumored, poison. It wasn’t merely that Sudeley was on the perv; he had married Catherine Parr secretly, against the will of the council, and that he now intended the princess should succeed the queen in his bed augured a seditious intent. The regents found out about it and swiped left, and their cockblock might have been the spur for Sudeley’s desperate attempt to grab the king’s own person; certainly his efforts to wed the princess featured among the many charges laid by the bill of attainder that claimed Sudeley’s head. Her stalker’s attentions also put Elizabeth under close questioning and had she not the sangfroid to deny resolutely any part in the man’s schemes her history, and ours, might have gone very differently. It’s not the last time that Elizabeth proved her mettle under interrogation. As touching the kind of his death, whether he be saved or no, I refer that to God only. What God can do, I can tell. I will not deny, but that he may in the twinkling of an eye save a man, and turn his heart. What he did, I cannot tell. And when a man hath two strokes with an axe, who can tell but that between two strokes he doth repent? It is very hard to judge. Well, I will not go so nigh to work; but this I will say, if they ask me what I think of his death, that he died very dangerously, irksomely, horribly. 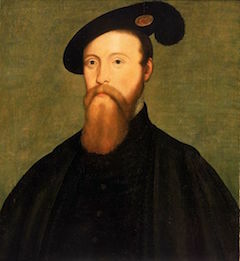 Edward Seymour himself set his own hand to his brother’s death warrant in concert with the rest of the regency council. In a fine case study for parents who might wish to impress quarreling children with their interest in finding common purpose, Edward met the same fate inside of three years. * Sudeley Castle still stands today, and is open to tourists. ** Also crashing at the maison Sudeley in 1548: Lady Jane Grey. One of Sudeley’s numerous vain machinations was to orchestrate a Jane Grey-Edward VI marriage.